National Institute of Oceanography and Fisheries, Inland Waters Branch, Lab. of Microbiology, El-Qanater Research Station. Six stations were chosen to represent the different micro-habitats along the southern part of Lake Manzala. In addition, two main drains, Bahr El-Baqar and Hadous were represented. Water and Bottom sediments were collected through four successive seasons (Autumn 1999 - Summer 2000) for physico-chemical and bacteriological analyses. The results showed that water temperature recorded the lowest value during Winter, while it recorded the highest during Summer with an annual amplitude 14.8°C. The Lake is shallow with a depth ranging from 0.85 - L31 m. The pH values were in the alkaline side. The water transparency fluctuated from 19.5 - 325 cm . The organic matter and organic carbon ranged from 5.28 - 8.71% and 3.06 - 5.06%, respectively. 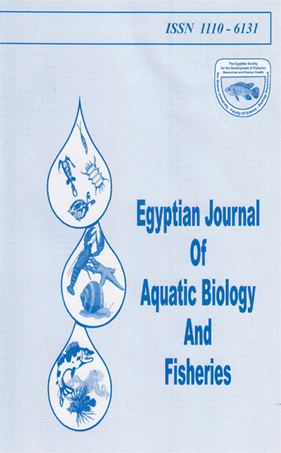 Bacteriological analysis showed that the highest counts of the studied bacteria were recorded in Bahr El-Baqar and Hadous Drains compared with Lake Manzala' stations.Conversly , the lowest counts of nitrifying bacteria were recorded in Bahr El-Baqar Drain and its discharge points.